Pursuit of Poppy: Oh, poop! Poppy goes pee-pee on the potty! A couple of posts ago, I mentioned we were having diaper dilemmas. The dilemma was that any type of diaper we tried was leaking. Apparently it was because she was holding her pee, and going all at once. So after being tired of getting peed on all day and having to do multiple outfit changes, I decided to get out her potty and stick her on it. The very first time I put her on it, she went! So now for the past 2 weeks, she has been going pee 4x a day. But we're not really "potty training", it's more of just me knowing when she is about to go pee and sticking her on the potty (while she plays with my empty make-up containers). Then yesterday while I was rinsing out her little potty, she was wandering around the bathroom leaving little brown nuggets everywhere! Gross, I know. 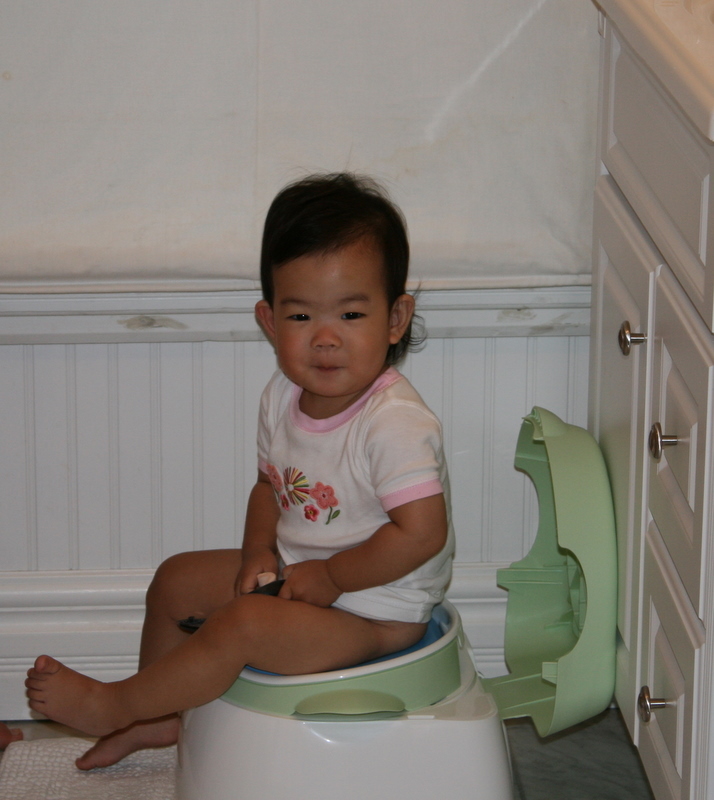 But then today, she went number 1 and number 2 in her potty!!! The look on her face was priceless. She looked down at what was in the potty and acted like it was gonna come out and bite her. She jumped off the potty and gave me the sign for "all done". It was hysterical. Sorry if that's too much information, but I said that now we're password protected I don't have to worry about what I say here! Anyways, this is such a weird situation because she knows what to do on the potty, but she's still not communicating with us (other than grunting when she sees food, and a few sign language signs we've shown her) so it's impossible to ask her is she has to go potty. Maybe I should learn the sign for potty and try using that? Oh, I was so not prepared for this so soon. What can I say, this girl loves to accessorize. OH MY GOD! Of course she is going potty - she is sooo smart! I love it!! *LOL* She's going to kill you one day for posting those photos! But they are so adorable! I can't believe she is going potty! What a smart little girl, imagine what she will do once you can communicate with each other more. R U kidding? This is great. I agree with Chandra, one day Poppy is going to get you for posting these photos but they are so darn cute. She seems to be one smart little cookie. Oh, that is tooooo funny! I think it's hilarious she was leaving "brown nuggets" all over the floor...now that's something Ella would do too! lol. Btw - the sign for potty is actually "toilet" - make the letter "t" with your hand (a fist with your thumb stuck between your first and middle finger) and hold it up and shake it back and forth a couple times. 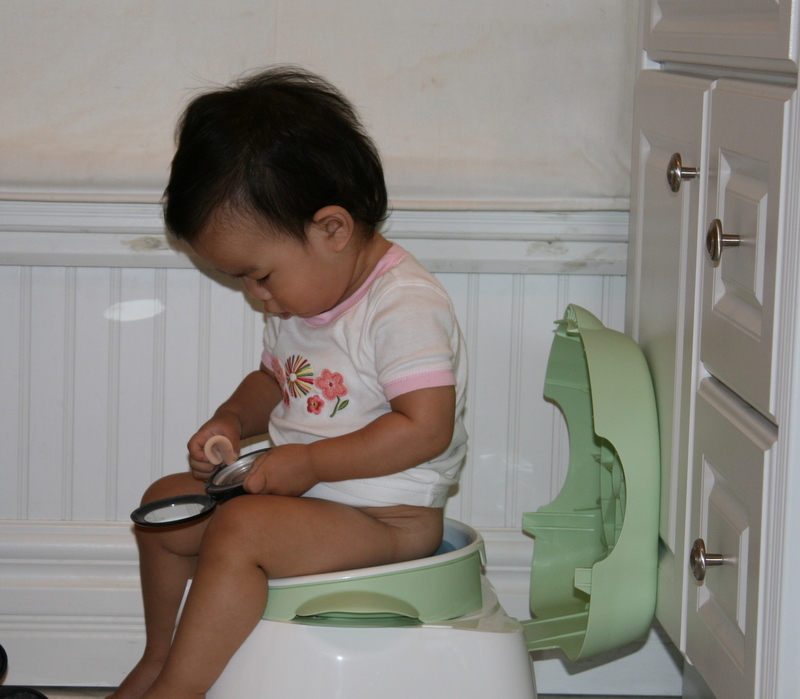 i bet she will be potty trained soon. 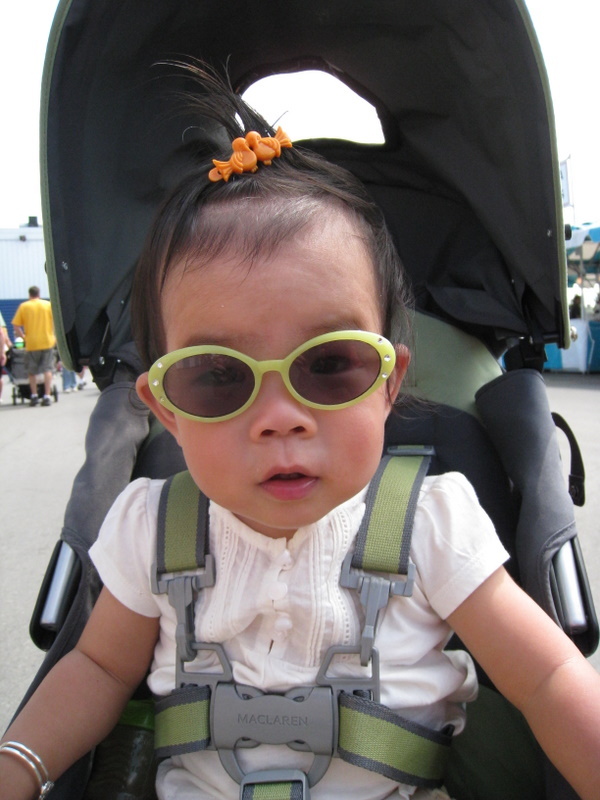 Never mind the potty pics, how cute is she with the glasses on!!! sign for poop: (right hand: make fist with thumb sticking up, left hand: make a fist and grasp right thumb - then pull the two fists apart) ... have you seen Meet the Fockers? ?